Tourists rightly identify the Rocky Mountains with Colorado. Many soon learn that the Rocky Mountains also define Colorado butterflies. Typically the mountains represent a dividing live between many so called eastern butterfly species and western butterfly species. The front range of Colorado, east of the Rocky Mountains consists of foothills and prairies. It supports a large and diverse butterfly population numbering close to one hundred species. Local parks and trails are abundant in this part of Colorado. There’s nothing holding back visitors from a pleasant butterfly day trip. Visitors looking for more butterfly diversity and volume without the hike can always stop by the North American butterfly house in Fort Collins. There they will have the opportunity to see up to 400 free-flying North American butterflies in action. The mountain areas to the west also host another distinct butterfly population. The Rocky Mountain National Park, for example, documents 141 butterfly species. Their top five species commonly seen by visitors: Mormon Fritillary; Painted Lady; Small Wood-Nymph; Spring Azure; Arctic Blue. Taken together, Colorado has always been a great state for butterfly enthusiasts. A close to even number of whites and yellows aslo testifies to butterfly diversity in the state. 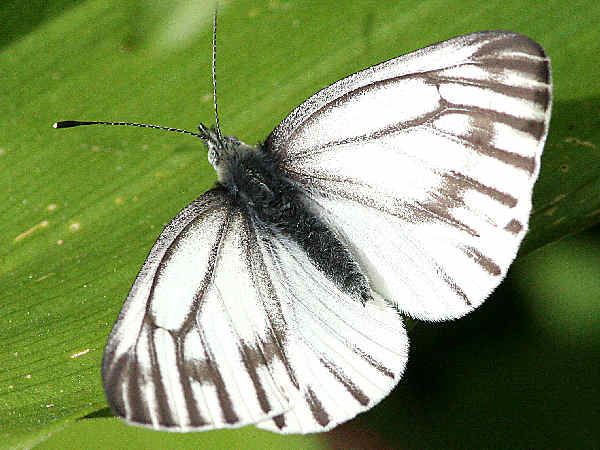 The picture shows a Margined White. 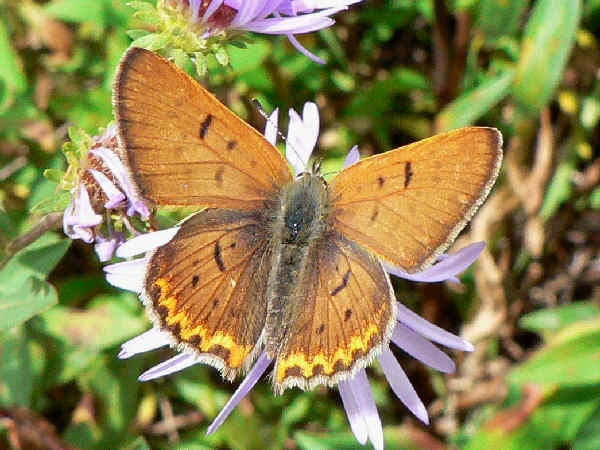 Almost six dozen blues, hairstreaks and coppers have been documented in Colorado. Hardly a day passes in butterfly season when one is not spotted in the mountains, fields, forests, gardens, and local tourist destinations. The picture shows a Blue Copper butterfly. It’s one of the exceptions to the general rule of butterfly identification for the category. Of course, the blues are suppose to have blue wings and copper butterflies are suppose to have copper color wings. Compare it to the Purplish Copper picture at the top of the page. Of additional interest, The Colorado Hairstreak Butterfly is recognized as the official state insect. 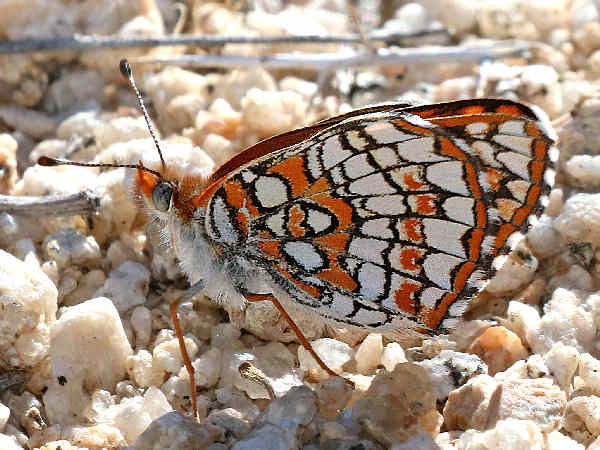 While Colorado hosts a large diversity of Brush Footed butterflies, a quick look down the list sees it filled with three common names, Fritillary, Checkerspot and Crescent. The picture shows a very colorful Sagebrush Checkerspot. Many of the Fritillary species are mountain butterflies, and tourists can easily spot a handful of them during a summer hike. Beware, the Speyeria genus of Fritillary butterflies rank as some of the most difficult species to differentiate. The common names of Arctic and Alpine also identify the mountain species. Colorado butterflies also mean swallowtail butterflies. All but the first two belong to the genus Papilio. 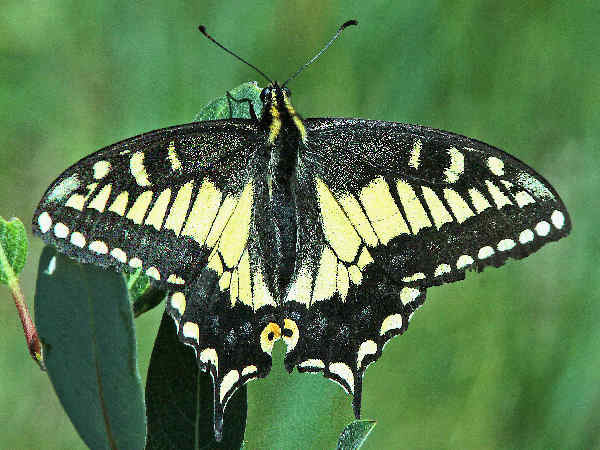 The presence of the Eastern Tiger Swallowtail and the Western Tiger Swallowtail exemplifies the Rocky Mountain butterfly divide. Expect to see them in gardens around the state, including the flower gardens typically found around the tourist hotels. The picture shows an Anise swallowtail. 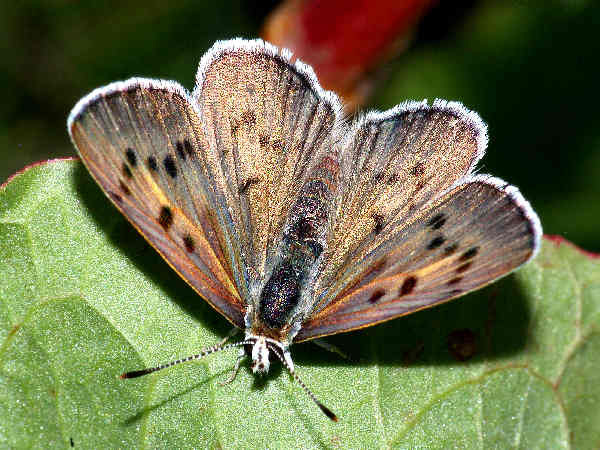 Two metalmark species also find a home in Colorado.